Swimming pool paint is important for proper maintenance and aesthetic purposes of your pool. It’s good to own a pool that has the right quality finish and the one that will withstand different environmental and climatic conditions. This article covers the top 5 pool paint for 2019 and gives you a buying guide to help you choose the best pool paint for your swimming pool. Here are the top 5 pool paints on the market today. This paint is made using a waterproof formula that is ideal for use in different climatic conditions from freeze to hot conditions. It is specially designed to be non-toxic and be used underwater. The paint is also plant and fish safe. Another thing about this paint is the self-priming formula that allows for better adhesion in order to provide an easy to clean and maintain surface. And you can put your pool into use when you paint it using this paint within 24 hours. Furthermore, the paint is perfect for use for use on all surfaces made of stone, plastics, coatings, wood, and metals. It is a versatile product that will justify its cost. This paint is recommended for pool owners in need of a durable paint that will provide a superb finish. 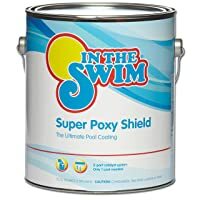 It is a great paint for covering stains, sealing cracks, and even refinishing plaster pools. When it comes to durability, the paint is among the most durable paints on the market. Actually, when you apply it the right way, it will provide an amazingly smooth pool area that will last for about 8 years. Hence, it is one of the most durable pool paints out there and is perfect for concrete pool too. The paint looks amazing as well. With a chic and sleek high-gloss finish that provides a refreshing feeling to any surface, it was designed to transform your swimming pool. 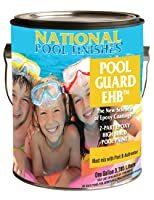 The National Pool Finishes Pool Guard EHB can be used for concrete, steel, gunite, and fiberglass swimming pools. And its application process is very easy, you only need to use a spray, brush, or roller to do this. Moreover, it is a durable paint that will make your pool remain attractive for years and it is quite affordable. In fact, you don’t need to break any bank to buy this paint. Another great thing about the paint is its self-priming – it will take a few minutes to dry out and you can use your pool as soon as possible. The paint is resistance to pool chemicals, chipping, U.V. rays, cracking, peeling, saltwater, and submersion. Thus, you can rest assured of getting a long-lasting product. Just like its name suggests, this is a super poxy paint that comes in a gallon to ensure that you complete your painting with ease. 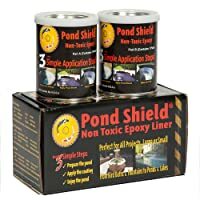 The paint is recommended for use on all pool surfaces and works well to cover any stain. One thing that you might like, a single application of the paint can last for about 8 years. And it provides a stain-resistant surface with a ceramic-like finish. Hence, it is always attractive to the eye and will make people want to be in and around your pool. It was designed to cover more ground with each application and one gallon covers about 150 sq. ft. Therefore, you can save a lot of money when compared to buying other paints. The 260542 Pool Paint is among the fastest drying paints and it comes ready for application. Taking only 6 hours to dry, you don’t need to wait for hours before you can start to use your repainted pool. However, if you intend to apply a second coat, you will need to wait for about 24 hours before you can use your pool. The paint can be used for plaster, masonry, gunite, and concrete pool. But you shouldn’t use it for fiberglass swimming pools. One gallon of the paint can cover around 100 ft. It is a handy product that will save you money when buying it. While there are a lot of pool paints that work effectively and look attractive, I would recommend you to paint your swimming pool using the existing paint. For example, if your facility is painted using epoxy paint, repaint it using the same brand – the same goes for acrylic. If you don’t know what kind of paint is already on your swimming pool, conduct the following chip test. Chip off a small part of the paint. Rub the chip in a few ounces of acrylic or epoxy paint solvent. If it starts to dissolve in any solvent easily, then you have the perfect match. For instance, if your chip dissolves in acrylic paint, it is acrylic paint. Q: How much gallons of paint should I purchase? A: The answer to how much paint you should buy will depend on different factors such as the paint you intend to buy, the number of coats you want to apply, and the size of your pool. Also, some paint covers more ground than others. Additionally, use the following equation to determine the gallons of paints your swimming pool will require: Length x Width x 1.7. If you want to apply 2 coats, multiply your answer by two and so on. 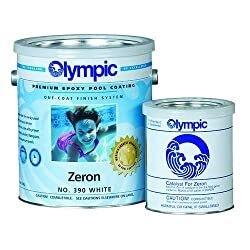 What is the best pool paint on the market? Okay, you now have an idea of what you should do to get the right paint for your swimming pool. 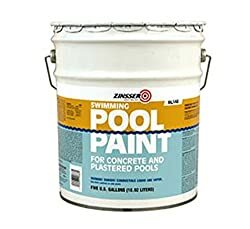 Note that this paint will turn your pool into a new facility and make it last longer. Also, remember that painting your pool is an easy and quick way to boost its appearance. With the best pool paint, you can easily paint your pool for under $1 a sq foot.